From left, Clinton County Commissioner Brenda K. Woods and Clinton County Commissioners President Patrick Haley mull the terms and language of a loan agreement Wednesday with the Murphy Theatre nonprofit corporation. 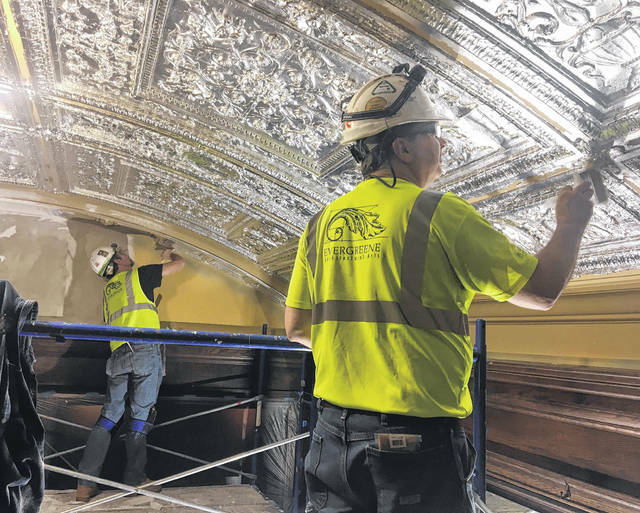 Reconditioning work was being performed on the ceiling of the Murphy Theatre’s inner lobby Wednesday, the same day county commissioners approved a $300,000 no-interest loan to the theatre nonprofit for new seating. Pictured are Edward Magee, foreground, and Norman Chaney, background, both of Evergreene Architectural Arts. WILMINGTON — On Wednesday county commissioners unanimously approved a $300,000 no-interest loan to the Murphy Theatre nonprofit organization to install new seats. The basic terms include an annual repayment of $15,000. Strictly speaking, the agreement is for a 10-year loan with a 20- year amortization (meaning the theatre will repay the loan at the 20-year rate of $15,000). Then, after 10 years, the theatre will owe the county a “balloon payment” consisting of all the remaining $150,000 loan principal. However, terms also allow the theatre, if it does not make a balloon payment, to request a refinancing of the original loan, which quite possibly would involve a $15,000 annual repayment for 10 additional years. 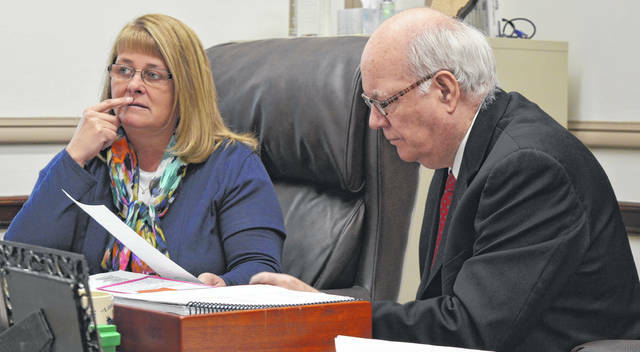 The 10-year term of the contract will allow future members of the Board of Clinton County Commissioners a decade from now to re-assess the loan in light of what occurs during the prior 10 years, commissioners have said previously. Earlier this week, private donors came forward and said they would personally guarantee the promissory note, providing financial security that helped calm the concerns of one county commissioner in particular, Brenda K. Woods. Woods made it clear again Wednesday she would not support a straight 20-year loan, without a 10-year reassessment clause. “I’m not going for 20 years,” Woods said at one juncture. The financial backer has asked to be anonymous in the news reports about the loan. The total project is estimated to cost $370,000, with the performing arts community theater contributing $70,000. Murphy Theatre supporters hope the seating project can be ready in time for the theatre’s 100th anniversary celebration this summer — a weeklong series of events from July 20 through July 28. Also Wednesday, commissioners held an executive session on a topic of personnel, specifically the disciplining or investigation of a public employee, according to Clinton County Commissioners President Patrick Haley.